With cold weather enveloping us during the holiday season, we start missing the warm weather. Located in South East Asia and with a perfect weather for this cold month, the Kingdom of Thailand is one of best places to visit this January. The country formerly known as Siam is hailed as the 13th friendliest country in the world. Aside from this, Thailand is also well known for its temples, beaches, martial arts, and, this is the most important, for their delicious food. Each country has its own beauty that’s incomparable to others. With that, here are some of the reasons why you should visit Thailand. Thailand is known for their mouth watering dishes; you don’t have to worry about getting hungry while roaming around the country because you can find the tangiest and spiciest Tom Yum soup, Pad Thai, Kaho Mun Gai (and a lot more) on the streets almost everywhere. Amphawa Floating Market is the oldest floating market in the country and it is really popular among tourists. Tourists can come here to enjoy picturesque views and have the privilege to taste their delicious cuisines (like I told you, in Thailand, food is everywhere). In here, people can also buy souvenirs and rent a boat to enjoy the view of fireflies at night. Buddhism is the number one religion in Thailand, so don’t wonder why they have a lot of temples in the country. But before you get too excited in visiting their wonderful temples, make sure that you have the proper outfit in your luggage. Their temples are sacred places and as a tourist, you should respect their norms and practices. Make sure to cover up your shoulders, legs, and ankles when you visit one of their temples. If you’re missing the feeling of having sand on your toes and salt in your hair, you’ll definitely love this country; Thailand has a warm weather all year round and numerous beautiful beaches. Like a lot of South East Asian countries, Thailand is best known for its paradise-esque tropical beaches that are just to die for. These are just some of the reasons why you should visit Thailand. The list could go on and on, but you could book your ticket and fly to Thailand now to see all of its wonders for yourself. 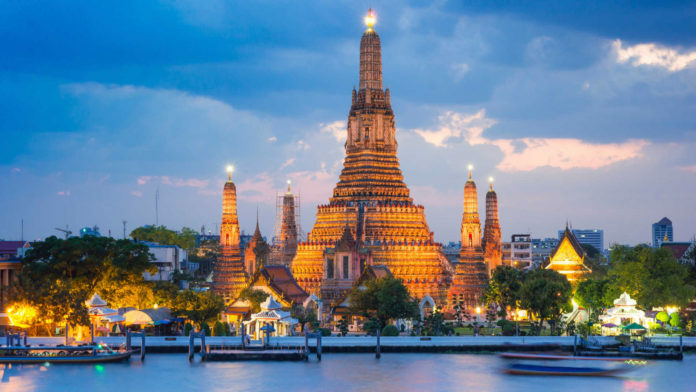 Fun fact about Thailand: Bangkok (the country’s capital) is known to locals as Krung Thep Maha Nakho. But its ceremonial name is Krungthepmahanakhon Amonrattanakosin Mahintharayutthaya Mahadilokphop Noppharatratchathaniburirom Udomratchaniwetmahasathan Amonphimanawatansathit Sakkathattiyawitsanukamprasit which is 169 characters!